“Heart of Gold”, an episode of Alfred Hitchcock Presents, Season 3 (1957), maintains an interesting narrative tension throughout its 25-minute runtime. This is due in part to this episode’s neat encapsulation of film noir aesthetics. It is based on a story by Henry Slesar, and this was the first work Hitchcock adapted from Slesar, whose stories would later be the basis for dozens of Hitchcock TV show episodes. Slesar’s tale was scripted by James Cavanagh and directed by Robert Stevens. Fatalism. Most of the characters have pasts they would like to forget and little hope for the future. The protagonist is just looking for escape and a safe refuge. Truth. The world is dark and obscure. People, whether police or outlaws, invariably misrepresent themselves and the circumstances. Loyalty. Noone can be trusted, and there is a desperate search for someone to trust and remain loyal to. Because such stories are dark and gothic, they require emphatic acting performances that suggest both elusiveness and threats. 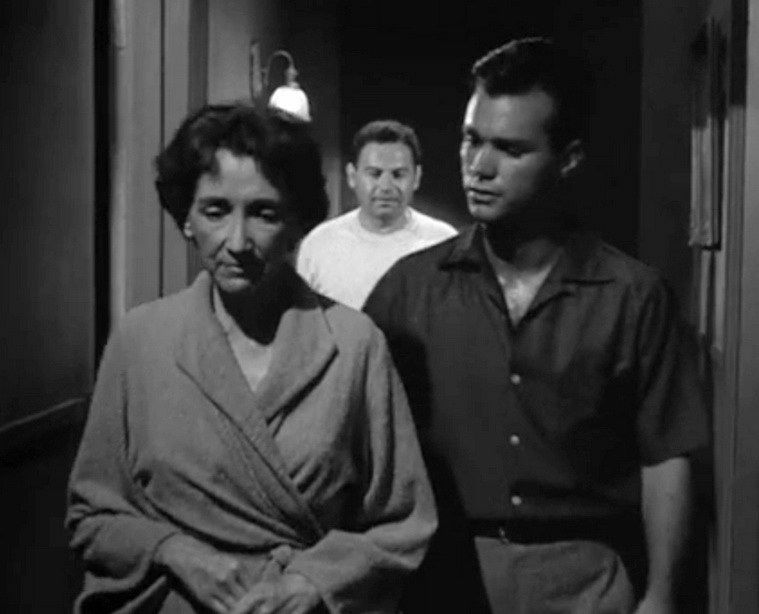 And this is exactly what we get from the characters in “Heart of Gold”: Mildred Dunnock (famous for her 1949 stage role in Arthur Miller’s Death of a Salesman), Darryl Hickman, and Nehemiah Persoff. The expressionistic atmosphere is also enhanced by the camera compositions, some of them in the form of high- and low-angle shots on the stairways. 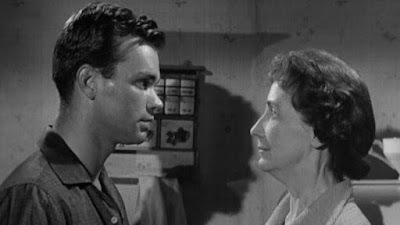 The story begins with Jackie Blake (Darryl Hickman), who has just been released from prison on parole, going to visit the mother, Martha Collins (Mildred Dunnock), of his still-in-prison former cellmate to assure her that her son is alright. He is first greeted by her scornful and abusively importuning other son, Ralph (Nehemiah Persoff); but Mrs. Collins turns out to be warn and receptive. In fact she urges Jackie to stay with her and board in her imprisoned son’s empty room. Jackie accepts, but he is suspicious of everyone and always feeling under threat, particularly from the slimy Ralph. The problem is Jackie was imprisoned for a failed bank robbery, for which he was the wheelman. Although all the thieves were caught, the stolen $150,000 was never recovered, and both gangsters and police think that Jackie knows the money’s whereabouts. Jackie swears he knows nothing about the money, and in fact his involvement in the caper was so minimal that he didn’t even know he was taking part in a bank robbery. Eventually a pair of thugs, demanding the helpless Jackie tell them where the money is, beat him up to within an inch of his life. Although we assume these thugs are gangsters associated with the original bank robbery, it turns out they were hired by Jackie’s professed “friend”, Ralph. It’s not as though Jackie is an angel, though. We see him in various shots tempted to steal money from his new employer at an automobile garage and from his new landlady. He is looking out for himself, but gradually he feels that there is, finally, someone he can trust – the woman with a heart of gold, Mrs. Collins. In a final confrontation, Jackie is physically attacked by Ralph; and when he holds a hastily grabbed knife in self-defense, Ralph is accidentally killed when he lunges at Jackie and engorges himself on the knife. Jackie, sobbing, tells Martha it was all an accident and begs her to accept him as another son. He swears total filial devotion to her. It is then that she tells him the bitter truth. She is not the person she had seemed to be. Besides the film noir theme to this story, there is another characteristic Hitchcockian narrative theme present. This is more connected with horror stories and involves the idea of a protagonist, who has been desperately fleeing a descent into Hell, finally discovering that the safe refuge he (or she) had thought he had found turns out to be in fact the very Hell he had been fleeing. This is the theme of Sartre’s No Exit (1944), and it appears also in Hitchcock productions, notably in "An Unlocked Window" (The Alfred Hitchcock Hour, Season Three: Episode 17, 1965). The Film Sufi, “‘Le Doulos’ - Jean-Pierre Melville (1962)”, The Film Sufi, (27 February 2009).